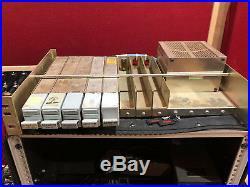 Quality 1960's preamps as good as Neve, API, Sphere, etc. Since theseare straight gain mic pres, included will be some mic attenuators. Your choiceof one 12db, one 18 db and one 24db. If you prefer two 18db or two 24dbattenuators, that is possible. This gives gain options when using the pres forkick and snare. A wonderfully balanced mic pre that has rich lows, really perfect mids, anda nice smooth top end. 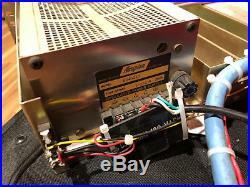 Low-noise, linear, regulated Acopian +24V"gold box" power supply. All modules were completely rebuilt and matched for gain where necessarywithin the last two years. TheAM-16 preamplifier is bit more aggressive than an API and sounds fantastic onalmost all sources. As good as any vintageNeve or API. All modules are wired to XLR I/O and for 150 ohms in/out. Sales to USA locations only. 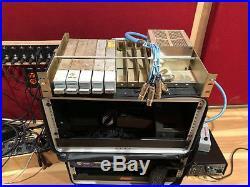 The item "5 Racked Vintage Langevin AM16 mic preamps" is in sale since Thursday, July 12, 2018. This item is in the category "Musical Instruments & Gear\Pro Audio Equipment\Preamps & Channel Strips". 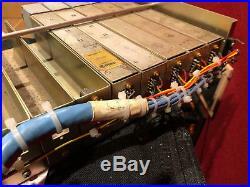 The seller is "bigredsound1" and is located in Skokie, Illinois. This item can be shipped to United States.